Styled with huet t-shirt and tie-front pant . 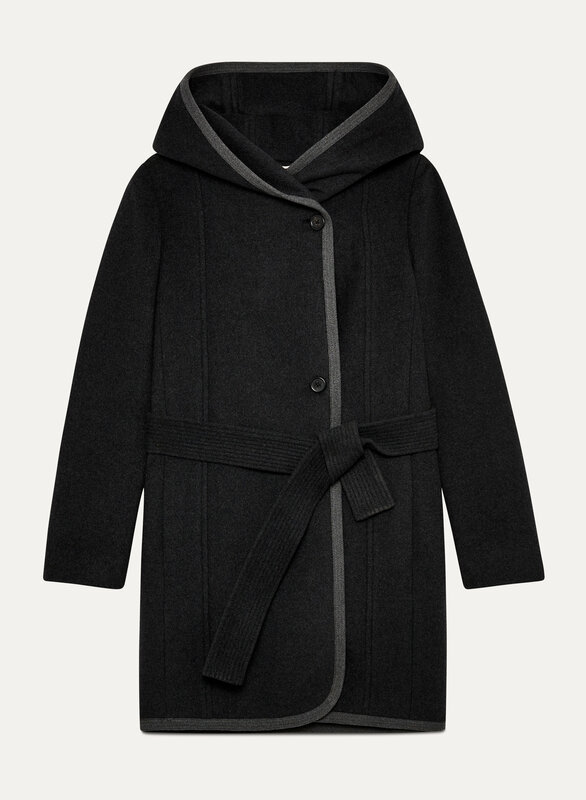 This much-loved coat is made with a warm wool-cashmere melton from one of Italy's finest mills. The fabric's tight weave is naturally resistant to wind and water, and precise tailoring makes for a streamlined fit. I bought this coat when it went on sale at the end of the season and its a really beautiful coat, the pictures do not do it justice! Plus it seems like really high quality wool. I found it fit a little bit large through the body but I am extremely petite so it would probably fit most true to size. I have to say though I am really impressed with the customer service at Aritzia so far (i'm a new customer). The last two times i've ordered from them the shipping was super fast like 2 days, and they don't dump parcels at your door like some companies do so you know its secure. 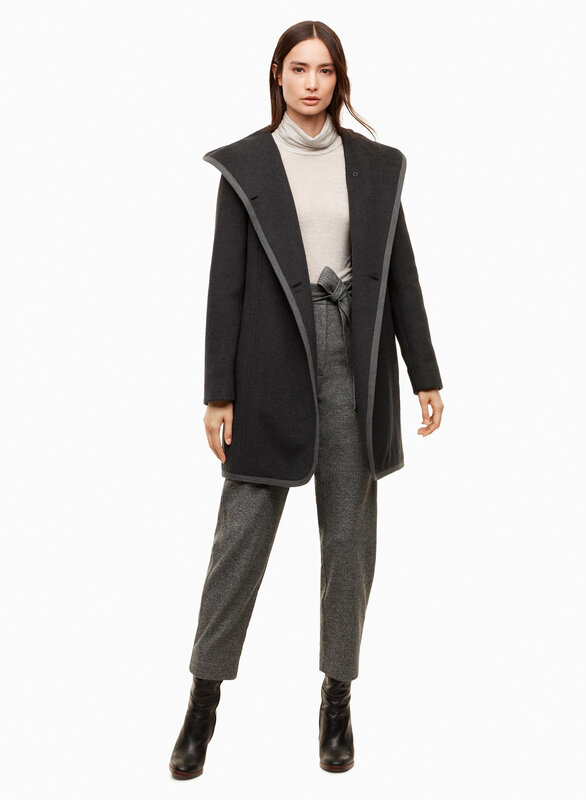 My coat was, however, missing the belt (it was end of season and one of the last ones in stock so they apparently ran out), but customer service was super apologetic and nice and offered me an additional discount, which made it an even more awesome price. Overall I find them a really pleasant and professional company to order from. I was eyeing this coat for a long time but unfortunately when I did buy it, it turned out to be way to wide on the body for my petite frame. It looks bulky but i wish it fit better because i love the coat and the tan colour. Nice and thick jacket. 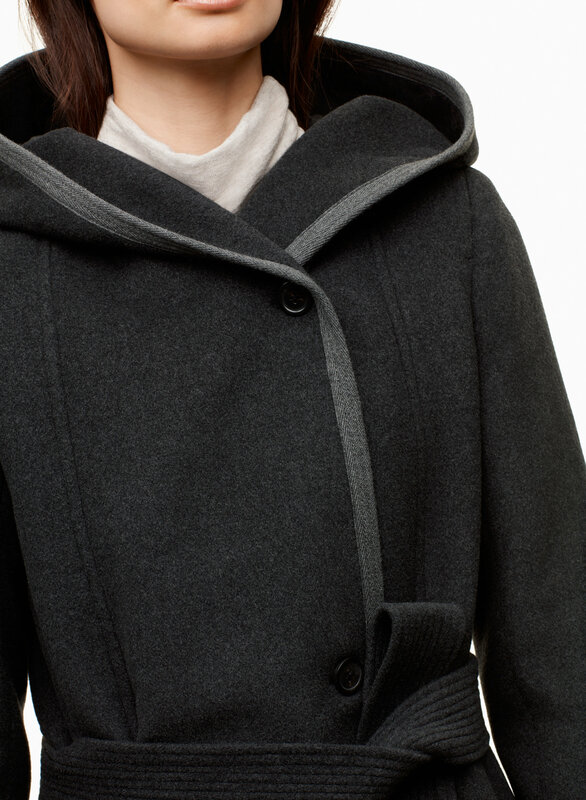 Fits wide on the body but tight around the armpits like most Babaton wool jackets. I really love the design, colour, and fit! So pleased with my purchase !! Best winter jacket so far! Love how warm and comfforbtale this jacket is! I get compliments all the time on the style. Also love that it blocks out the wind and the density of the jacket means it does not flap around or fly around as you walk. Best jacket. Need to get it in more colors! 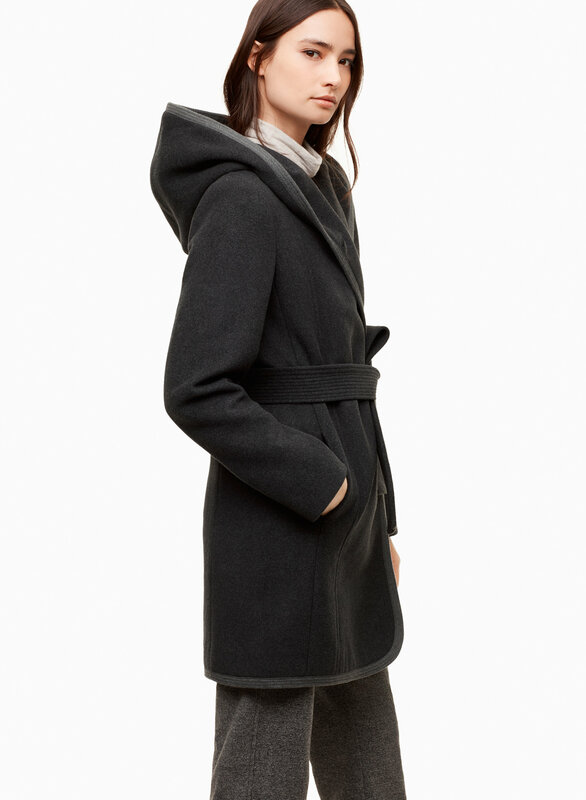 I would definitely recommend this coat. You can dress it up, dress it down. It's exactly what I was looking for and the price is so cheap!!! The coat I received wasn't the color I ordered but I was happy for that ! It was much cuter and so soft. I ordered a large since I wanted to wear a thick sweater under it and I can! My chest can get in the way a little but it still fits and there's nothing I do not love about it. The hood is amazing in keeping me warm and keeping out the cold. I love the lining inside and the trim along the edges. It is a fantastic purchase I do not regret! 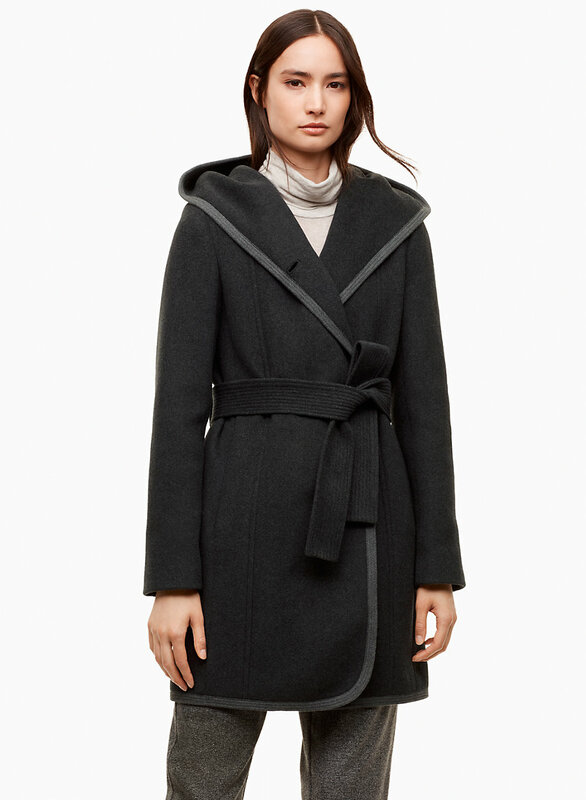 Recommend I like the hood good leght and like the belt.. I'm usually xs in Aritzia coats. This one is pretty tight around the shoulders. I had to exchange for a smaller size and it was stillkinda tight. Will be hard to layer and move comfortably. The style and fit of this coat is fantastic! It’s soft and super warm. 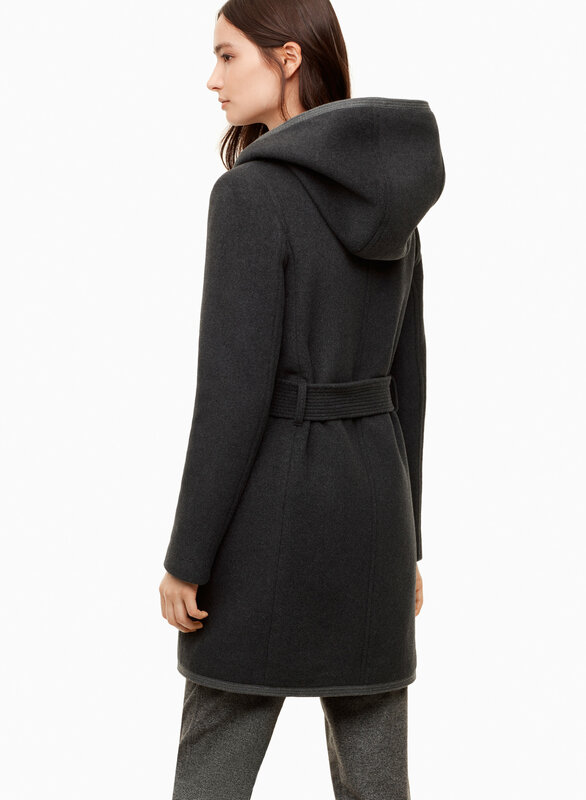 Finally found the perfect hooded wool coat for winter! It’s way cuter without the belt which I removed with a stick ripper! I love this jacket because you can dress it up or down. Plus it’s super comfy and warm. Been eyeing this jacket for so long and happy I finally made the purchase. I’d buy it in every colour if i could! !